We are part of the Dharma Realm Buddhist Association (DRBA). Our founder and teacher is Venerable Master Hsuan Hua. The Avatamsaka Monastery is a branch of the Dharma Realm Buddhist Association in Alberta, Canada. The founder, the Venerable Master Hsuan Hua worked tirelessly to overcome adversity. He pushed for Sutra translations, built numerous monasteries, founded schools, and developed talented Sangha members. 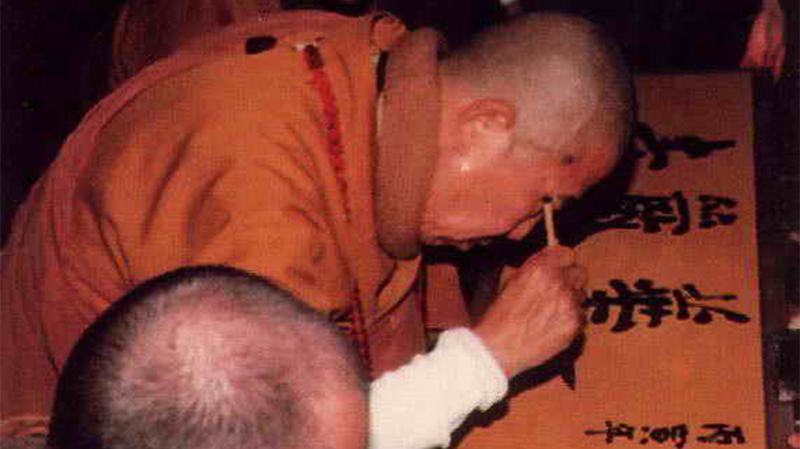 He taught living beings in the Dharma Ending Age about the Proper Dharma so that they would cultivate honestly. He never paused to transform and guide living beings. In 1985 members of the Dharma Realm Buddhist Association first came to Calgary. Avatamsaka Monastery was then located in southeast Calgary near the zoo in a district called Ramsey. The all brick building was small 3,000 ft2 in a difficult to find location. In just three or four years, members began looking for a larger facility . NowFinally, in 1996 the Avatamsaka Monastery moved to the new building located on the edge of the downtown district. The building sits adjacent to the Bow River, contains about 21,000 ft2 of floor space, and is constructed of reinforced concrete capable of supporting more than three additional stories. Presently, the Buddha Hall, library, reception area, and offices occupy the main floor, while the kitchen, dining hall, monk's quarters, one small class room, storage space, and a workshop are in the basement. The Sunday school With the Venerable Master Hsuan Hua as the inspiration and spiritual leader, the Dharma Realm Buddhist Association exists to promote Buddhist ideals. To promote these ideals, the Dharma Realm Buddhist Association emphasizes four major activities. The first is to support a strong and dynamic Sangha (Sangha is defined as a gathering of at least three ordained monks or nuns). The second is to translate the Buddhist scriptures into all the languages of the world. The third is to establish a comprehensive system of Buddhist education with schools for students of all ages. The fourth is to promote rigorous personal cultivation by maintaining a strict schedule of retreats including meditation sessions, Pure Land practice sessions, repentances, and sutra recitations. Mantras, called the Esoteric, or " Secret School"
We celebrate Buddhist holidays year round and have retreat sessions once in a while. Some of our other activities include meditation classes, sutra lectures and talks on the Dharma, Honouring our Elders, Liberating Life and day trips to Castle Mountain. These activities are all open to the public, for free. Monks and Nuns live in the monastery begin their day at 4:00 a.m. until 10:00 p.m. For laypeople (regular people who practice Buddhism), their day depends on themselves.